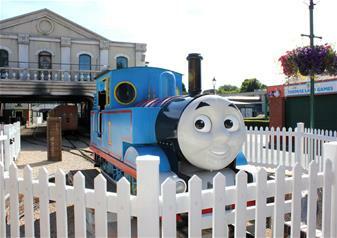 Enter ‘The Island of Sodor’ where Thomas and his friends welcome you to rides and attractions shows and much more! Visit the zoo, home to over 100 animals! Drayton Manor also has a hotel visit www.draytonmanor.co.uk for more information. Have an action-packed day full of adventure, laughs and family fun at Drayton Manor Park home to Europe’s only Thomas Land. The awesome theme park in Staffordshire, England. Drayton Manor has plenty of adrenaline-pumping rides ideal for groups of friends, as well as family rides, a zoo and of course Thomas Land. Experience Europe’s only stand up coaster with a ride of The Shockwave and get the adrenaline pumping with rides such as Air Race, Apocalypse, Maelstrom, Pandemonium and Stormforce 10. Ideal for young and old to enjoy together, have fun at the 4D cinema, the Carousel, Accelerator, Dodgems and the Jolly Buccaneer. Visit The Zoo to see over 100 animals and don’t forget to play a round of mini golf! Enter Thomas Land for an amazing range of Thomas the Tank Engine themed rides and adventures for small children and all the family to enjoy! Ride on Bertie Bus, the Blue Mountain Engines and Sodor Classic Cars. Visit Terence’s Driving School, Jeremy Jet’s Flying Academy and explore the Thomas Exhibition! You can even catch a ride on Thomas himself as he takes you to the zoo! Drayton Manor Park, Near Tamworth, Staffordshire B78 3TW.